When brain regions that control speech and reading comprehension are destroyed due to blockage of blood flow, patients are often unable to speak or comprehend spoken or written language. These difficulties with language, or “aphasia,” are a common symptom in the aftermath of stroke. However, in a new study published in Restorative Neurology and Neuroscience, researchers report that damage to the underlying connections among different areas of the brain can also affect the severity of aphasia. The brain’s macro architecture of connections can be reproduced as a “connectome” composed of nodes representing various regions of the brain and their edges, the connections between such nodes. Some of these nodes function as hubs, which are fundamental to the overall organization and distribution of information throughout the brain. When a network hub has an excess of interconnections, it is part of a so-called “rich club network.” There is a growing body of evidence that damage to this rich club network can impair various speech and reading functions in much the same way as direct damage to brain regions normally associated with speech and comprehension. This investigation involved 44 patients who had experienced a left hemisphere ischemic stroke at least six months prior to the study. Aphasia testing used the Western Aphasia Battery, which determined overall aphasia severity, as well as sub-assessments of speech fluency, auditory comprehension, speech repetition, and naming. Each participant was assigned an Aphasia Quotient (WAB-AQ) as a measure of severity. MRI Diffusion Tensor Imaging (MRI-DTI), which can map the interconnections between brain regions, was used to identify the rich club network in each individual patient. Investigators found that when imaging revealed that the post-stroke patients studied had different distributions of rich club nodes, their aphasia could differ markedly. They present a striking example in which two patients had similar volumes of stroke damage but very dissimilar numbers of rich club nodes remaining nearby. 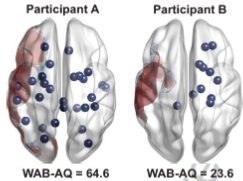 Patient B had more severe aphasia (lower WAB-AQ = 23.6) than patient A (WAB-AB = 64.6). Caption: Two representative participants were drawn from our sample to demonstrate the relationship between number of rich club nodes in each hemisphere and language performance. Despite comparable lesion volumes (A = 5796 voxels, B= 5614 voxels) and number of right-hemisphere rich club nodes, patient B – who had one isolated left-hemisphere rich club node – showed remarkably low language performance compared to patient A, who had fourteen nodes participation in the rich club on the left hemisphere. “Subjects whose spared cortical language regions are integrated into the remaining network as rich club nodes are less likely to have more severe forms of aphasia,” explained lead investigators Ezequiel Gleichgerrcht, MD, PhD, and Leonardo Bonilha, MD, PhD, from the Department of Neurology, Medical University of South Carolina. “Preservation of structural brain network hubs is associated with less severe post-stroke aphasia,” by Ezequiel Gleichgerrcht, Madison Kocher, Travis Nesland, Chris Rorden, Julius Fridriksson and Leonardo Bonilha. Restorative Neurology and Neuroscience, Volume 34, Issue 1, DOI 10.3233/RNN-150511, published by IOS Press. Full text of the article is available to credentialed journalists upon request. Contact Daphne Watrin, IOS Press at +31 20 688 3355 or d.watrin@iospress.nl. Journalists wishing to interview the authors should contact Ezequiel Gleichgerrcht at gleichge@musc.edu.